Democrats criticized this move by Trump, saying the firing is catastrophic to the investigation into Russian meddling in the 2016 campaign. Republicans mostly stood behind the president. NPR’s Robert Siegel talks with Thomas O’Connor, president of the FBI Agents Association, about President Trump’s surprise firing of FBI Director James Comey. President Trump’s firing of the FBI director throws into question the agency’s investigation into possible ties between Russia and the Trump campaign during the 2016 election. NPR’s Robert Siegel talks with Benjamin Wittes, senior fellow in governance studies at the Brookings Institution and editor in chief of Lawfare, about Trump’s firing of FBI Director James Comey. President Trump’s firing of the FBI director is being compared to the Saturday Night Massacre, which was when President Richard Nixon dismissed independent special prosecutor Archibald Cox. 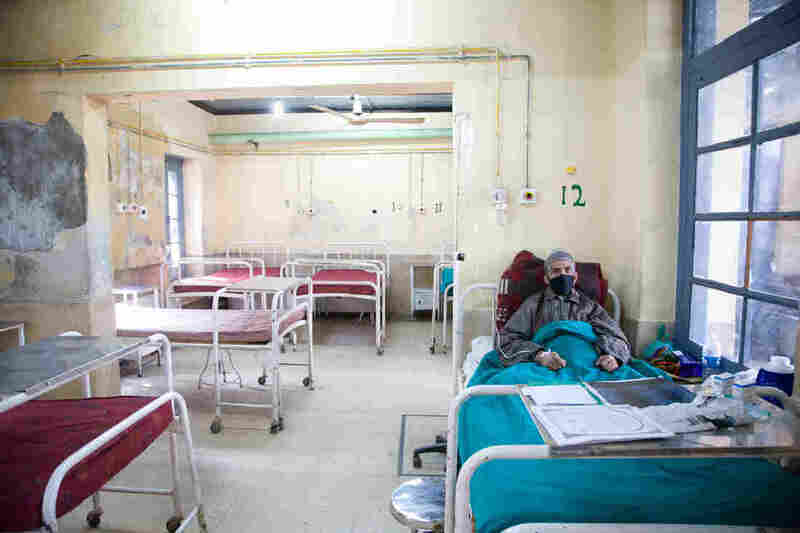 A tuberculosis patient in a hospital for chest diseases in the Indian region of Kashmir. Drug resistant tuberculosis is expected to increase globally over the next two decades. New research predicts a steady rise in TB cases that can’t be cured with conventional, first-line antibiotics in four countries. Researchers from the Centers for Disease Control and Prevention forecast that these complicated — and potentially deadly — cases of TB will become far more common in Russia, India, the Philippines and South Africa by the year 2040. These four countries already have the bulk of the world’s drug resistant tuberculosis. Because the disease is highly contagious, things look like they’re going to get worse before they get better, even with major efforts to curtail the spread. Last year according to the World Health Organization, there were more than 10 million new cases of TB (both drug-resistant and regular) globally and nearly 2 million TB-related deaths. Even the simplest cases are difficult to treat. Treatment for drug resistant TB can take up to two years, involve daily injections of highly toxic drugs and can come with severe side effects including psychosis and hearing loss. Some new strains have emerged that aren’t treatable at all. These cases are labeled “totally drug resistant” because the infections don’t respond to any available antibiotics. The fatality rate is 100 percent. Part of what’s terrifying about tuberculosis — and particularly drug-resistant TB — is that the bacteria spread through the air. Someone with TB can cough in a room and potentially infect many other people. Because treatment is so complicated Cegielski says there needs to a lot more attention to preventing new infections in the first place. 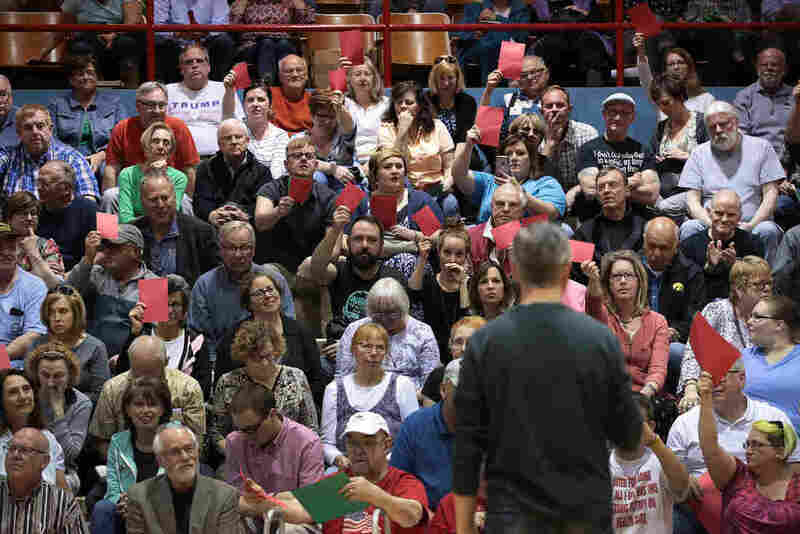 People attending Rep. Rod Blum’s town hall event in Dubuque, Iowa, this week held up red sheets of paper to show disagreement with what the Republican congressman was saying, and green to show they concurred. The GOP health care bill was a major concern of many. Town hall meetings got loud for some Republican members of Congress this week, as they defended the passage of the American Health Care Act by the House of Representatives. Constituents have been asking a lot of questions, and we’ve been fact-checking the answers given by some leading GOP lawmakers. “No, no, no,” Reed told the parent. The bill does have language that says insurers cannot deny people coverage or charge them more just because they have a pre-existing condition. However, the GOP bill also has an enormous loophole in that regard. The plan allows states to apply for waivers from the federal government that gets them out of many of the regulations put in place under the Affordable Care Act – including one that bans insurance companies from charging people with pre-existing conditions more for a health plan. A waiver would allow insurance companies to consider a person’s health status when determining what to charge for coverage. And that means that although someone with a pre-existing condition who lives in a state that got a waiver would have to be offered a policy, it could be very expensive. Scalise, like Reed, is pointing to the language in the bill that retains the Obamacare rules that prohibit insurers from charging people with expensive medical conditions more than their neighbors of the same age for an insurance policy. But the state waivers allow insurers a way around that guarantee. Before the Affordable Care Act, insurance companies denied coverage or charged more if the person who wanted insurance had any of a long list of conditions — including arthritis, diabetes heart disease, muscular dystrophy, obesity and sleep apnea, according to a list compiled by the Kaiser Family Foundation from insurers’ underwriting guidelines. Insurers also could refuse to cover many medications, including drugs that treat cancer, diabetes, AIDS or arthritis, according to Kaiser. If you have cancer and buy insurance that doesn’t pay for your cancer treatment, your pre-existing condition is effectively excluded. Blum’s statement refers to a couple of big things — employer coverage and Medicaid. As to employer coverage, whether your insurance would change under the GOP bill depends on whether your company is based — and buys its insurance — in a state that gets a waiver. In “waiver states,” employers’ insurance policies might no longer be subject to Obamacare regulations around so-called essential health benefits — the minimal benefits that must be included in a policy. They also might no longer be subject to restrictions on annual and lifetime spending caps. That means, in those states, your employer-sponsored health insurance policy could deny coverage for some categories of care, such as mental health care or maternity coverage. And the health plan could impose annual or lifetime limits on insurance benefits. So workers with very expensive conditions, or their family members with such conditions, could see their costs pile up — even if they have health coverage through work. Before Obamacare, about 60 percent of employers had lifetime limits on their health plans. Blum’s second statement – the one in regards to Medicaid — is false. The GOP health bill makes major changes to Medicaid, first by rolling back the expansion of the program over time. The bill allows people to keep their expanded Medicaid as long as they remain eligible. But people at or near the poverty level often see their incomes fluctuate, making them temporarily ineligible for the health care program. Under the GOP bill, once they leave the Medicaid rolls, they would not be able to return, even if their income declines. In addition, the bill fundamentally changes how the U.S. government finances Medicaid. States would receive a fixed amount of money from the federal government for each beneficiary, rather than an amount that varies according to the numbers of Medicaid beneficiaries and their health care needs. Most analysts say that, over time, the level of services Medicaid could provide would decline if the GOP health bill becomes law, and the states would have to cut back on services. That forecast is borne out by the Congressional Budget Office, which said the changes to Medicaid would cut the costs of the program by $880 billion over 10 years. Many services provided by Medicaid today, including home health care and services for people with disabilities, are considered “optional” under the GOP health bill. Those are also the services that help keep people out of hospitals and nursing homes. 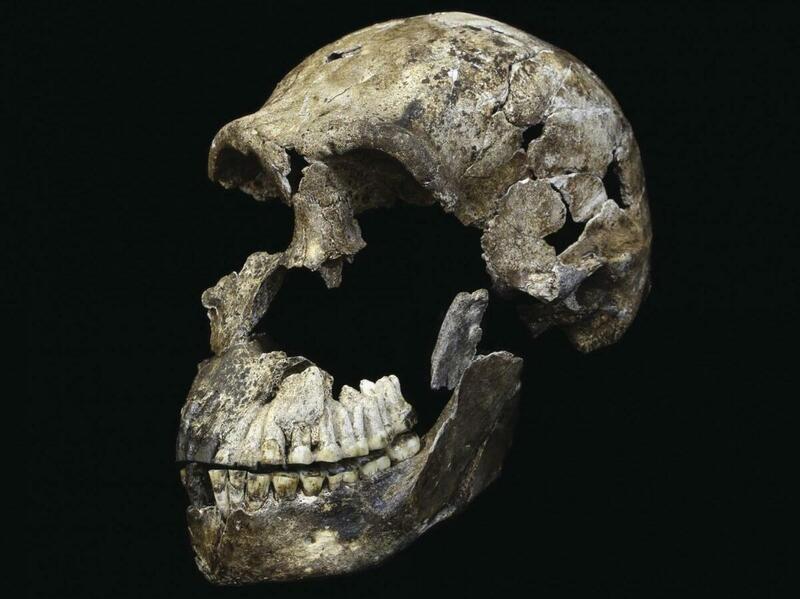 This is a skull of Homo naledi from the Rising Star Cave system in South Africa. The bones of a human-like creature have puzzled scientists since they were found in a South African cave in 2013. Homo naledi is primitive in some ways, with a small brain and other physical features reminiscent of our early ancestors. But it also walked upright, and had hands that may have been capable of making tools. This perplexing combination of features raised questions about when the animal walked the Earth. But in new research published today in eLife, scientists have come to the conclusion that it lived between 335,000-236,000 years ago. That’s only about a tenth of the age some experts previously predicted. It suggests that this human-life creature may have lived alongside early humans, or Homo sapiens. “It’s a much more complex picture of human evolution that is rising,” lead author Paul Dirks of James Cook University and the University of Witwatersrand tells The Two-Way. The research team also announced today that they have discovered a new chamber containing additional Homo naledi fossils in the Rising Star cave system, where the first specimens were found four years ago. 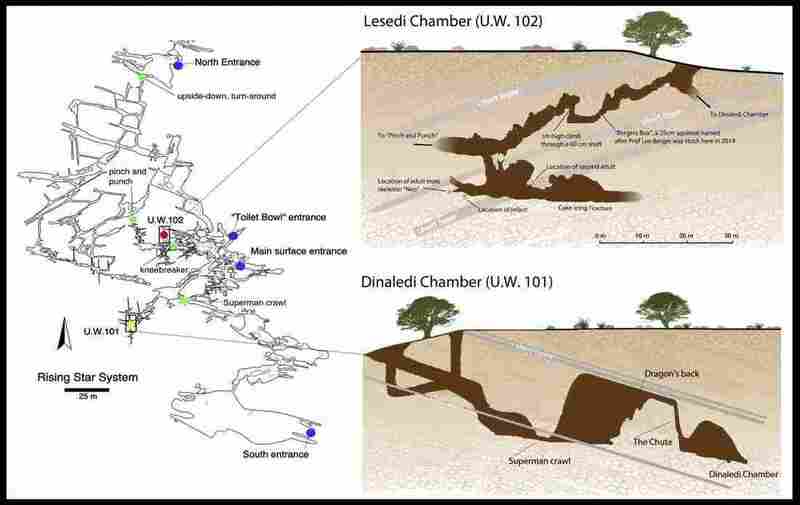 A schematic of the Rising Star cave system, where the Homo naledi fossils were found. Homo naledi‘s age and other recent discoveries complicate previous ideas of how humans evolved. “Traditionally, not all that long ago, human evolution was pretty much viewed as a linear sort of progression towards larger-brained animals,” Dirks says. That conclusion is “less clear and less certain now,” he says. It’s a controversial suggestion. Potts calls it a “non-starter,” pointing out that no evidence of tools has been found with the Homo naledi remains. “There’s nothing about naledi that implies it was the originator of that novel way of life.” He says that he thinks a likely explanation for the creature is that it actually “evolved and persisted isolated” from other relatives of humans.